A new mattress topper is a more economical way to provide just the right environment for a good night’s sleep. Just like mattresses, they come in a huge variety of thicknesses, softness, and materials. They can be purchased at the fraction of the price of a new mattress set. And, they can be chosen to fit your specific sleeping pattern. It’s important to keep your body in the healthiest and most comfortable posture, no matter what your preferred style. In this review, we’ll look at mattress toppers that are best suited for side sleepers. Whether you are a pillow hugger or stretch out like a plank, you are in this group – and did you know it’s the most popular sleeping position? For you side sleepers, consider the topper that will keep pressure off the areas closest to the mattress – your shoulders and hips. Secondly, you’ll want the topper to be thick enough to cradle the rest of your body comfortably and to keep your spine straight and neutral as you sleep. In this case, softer is better. If you think about where your body presses into the mattress as you sleep, you’ll be able to visualize where the extra cushioning is lacking on your existing mattress. You’ll want extra padding for those pressure points, and soft support around and below the rest of your body. Ideally, the thickness of your topper will be between 2 and 4 inches. Too thick, and heat will start to build up – making for an uncomfortable night. Too thin, and you’ll lack that critical cradling support. We’ll look exclusively at toppers that address these issues. Thickness – Mattress toppers can get pretty thick – up to several inches. If you don’t want to add extra height to an already tall bed, or if you’re worried about buying new sheets that will accommodate the added thickness, this could be a point to consider. Materials – You may have a preference for a greener lifestyle and prefer natural materials. Or, you may have a sensitivity to certain components, such as latex. We will review toppers made from a variety of materials, from bamboo to polyurethane memory foam, so that you can make the decision that is healthiest for you. Heat retention – If you are constantly kicking off the blankets – even in the winter – as you try to find a comfortable temperature, you’ll want to consider a mattress topper with better ventilation and the ability to keep you cool. Both design and materials come into play here. We’ll advise on the toppers that will keep you comfortable. Cleaning – You may prefer the option of being able to launder your mattress topper. We’ll let you know if our reviewed products can be laundered, or if they need spot cleaning. This topper is made from SleepJoy’s ViscO2 memory foam. For the chemically sensitive, you’ll be interested in the CertiPur-US certification for this material, which is free from heavy metals, formaldehyde, and other chemicals, and also meets low emission requirements for VOC – or volatile organic compounds. This also means that this pad has less odor after being unwrapped and put on your bed. Coming in at 3 inches thick, the topper is constructed from memory foam, and is ventilated, to allow for better airflow and less heat retention. 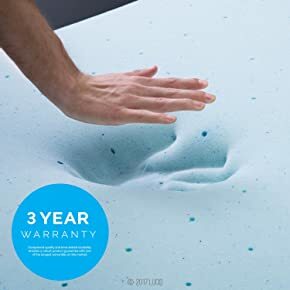 Reviewers noted that it was slightly firmer than other memory foam pads and that they didn’t feel like they were sinking into it. The pad arrives rolled and condensed and will need to be allowed to sit for a time to decompress and reach its full height. A number of reviewers commented that there was a slight synthetic smell, but that it went away within a few hours. This is topper can be spot-cleaned and is made in the USA. It features a 5-year warranty. Relatively lightweight and can be easily used to put on guest beds, RV beds, etc. Will need a cover. Reviewers noted that hair and dust stick easily to the bare foam. The product seems to run a little smaller than the average-sized mattress, leaving a slight gap around the edges between pad and mattress. This is one of the firmer pads we reviewed, and may not be soft enough for some sleepers. This mattress pad combines a softer sleeping surface for side sleepers, uses hypoallergenic materials, and can be laundered. The design allows for fitting over the entire top and sides of your mattress and will fit any mattress up to 18” thick. Elastic sides hold the pad down and prevent creeping. Since this pad is not made with memory foam, it is ideal for anyone with an allergy or sensitivity to latex or other materials. It features a pillow top that uses Revoloft – a fiberfill that has a feel similar to down or feather beds but uses all hypoallergenic materials, including bamboo rayon. The top is quilted to prevent movement of the filling. Reviewers mention frequently that this topper is cool and comfortable, because of the loft construction. It has no odor after unwrapping and is put on the mattress like a fitted sheet. It works best for side sleepers who want a firmer bed, but also to relieve pressure points. The pad is made in the USA, and is machine washable or can be spot cleaned. Hypoallergenic and can be laundered, reducing allergens. Lofted fill gives a cooler sleeping experience than foam. Easy to change sheets without worrying about the topper moving around, as it stays in place on the mattress. This does not provide the molding sensation of memory foam but feels more like a traditional feather bed. Some reviewers have mentioned problems with laundering the pad, but have received exceptional customer service for their issues. Heavier sleepers may not find this pad soft enough. The Gel Swirl topper has, as you might guess from the name, cooling gel that is infused throughout the memory foam. 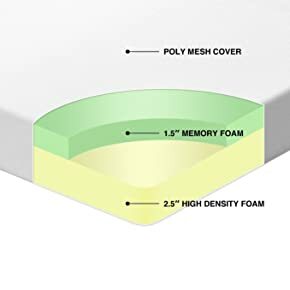 At three inches thick, this topper provides a lot of padding, while allowing for a lot of the “give” associated with memory foam. The item arrives compressed and rolled, and the manufacturer recommends letting it sit for 24 hours to completely expand and let any odors dissipate. The topper has two features to help with keeping the sleeper cool. The gel shows up as a blue marbled pattern on the topper. This, along with the open cell memory foam, is what the manufacturer claims as the key to better ventilation and cooling. The 3-inch depth cradles you more than thinner pads and conforms to your body. Although some reviewers commented that they found this topper to be too cool for them, the resounding majority were happy with their good night’s sleep. Several commented on how the thickness of the topper left them nowhere near the mattress, and that it was great for minimizing movement of the mattress from another sleeper. This is a heavier topper, weighing in at 17 pounds, and has a 3-year guarantee. It can be spot cleaned. This topper is highly rated for giving a cooler night’s sleep. The thickness is substantial and this is a good choice for larger sleepers. This topper is also available in 2 and 4-inch thicknesses, for a more customized experience. Reviewers commented on the smell after unwrapping – this takes at least 24 hours to evaporate. At 17 pounds, this may be a bit of a hassle to unwrap and haul onto your bed, without assistance. As with all memory foam products, purchasing a cover is recommended to keep it clean. Although all the products we reviewed are great for side sleepers, there are still individual preferences on how soft you’d like your mattress to be. This topper offers both a 4-inch thickness and visco-elastic memory foam to provide a softer feel that also gives gentle support. The “cool polymer” design is a feature to help dissipate heat and provide a more comfortable sleeping experience. The Red Nomad foam is certified by the CertiPUR-US program to meet low emission requirements for volatile organic compounds. It is also manufactured in the USA. The topper arrives rolled and double boxed, and the company recommends letting it expand for 24 hours before use. Because of the thickness, it is designed to be slightly smaller than the mattress it goes on – so that fitted sheets continue to go on easily. This topper was reviewed very positively by buyers who had a very firm mattress and were seeking something to balance out their need and preference for something with more support. Several mentioned how well it customized their preference, and many mentioned that it was cool to sleep on. If you’re looking to really transform a firm mattress you have to live with, this is a great option. This topper is quite heavy, at just over 26 pounds, and the use of a cover is recommended to keep it clean, as well as obtaining a helper to assist with getting in on the mattress. Visco-elastic foam is softer than the usual memory foams. Cooler than many toppers of comparable thickness. Designed to work better with fitted sheets. Definitely will have an odor upon unboxing. Allow for plenty of time for it to decompress and air out before using. Might be too soft for some sleepers. The 4” thickness may require you to purchase new sheets that will accommodate it. 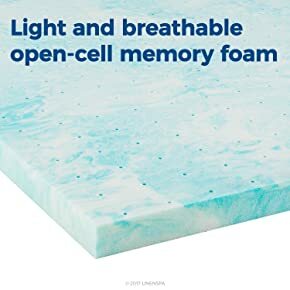 The Lucid Gel Memory Foam Topper is another gel/memory foam blend, and it really stands out in the number of rave reviews it has been awarded by pregnant women. Customer after customer talked about how it was a more comfortable, supportive sleeping environment for them after they put it on their bed. The thickness and soft gel support seem to work well for both the pregnant and those who toss and turn a lot in their sleep. The foam is infused with a gel that helps keep the sleeper cool through capturing and distributing heat and it also features ventilation channels. The entire pad arrives very flat, and the manufacturer recommends letting it sit for two days to fully expand. There were no reviewers that mentioned a lingering smell after they let it fully decompress and air out. At 3 inches, it provides a lot of softness. If you enjoy sinking into your bed a bit, this is a good choice. 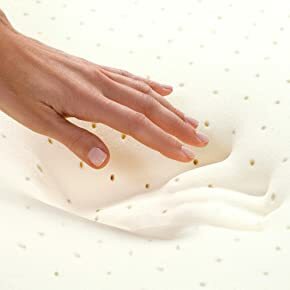 Some customers commented that this particular pad can run a little large, and indeed, the maker recommends that it be used with a mattress pad or cover. This would help keep it conformed to the mattress and not slip. It comes with a 3-year warranty. Rated highly for pregnant women sleepers. One of the softer toppers. Stays cooler than plain memory foam. Works best with a cover/protector. This topper is thick, supportive, and has some nice extra features included for the price. If you’re purchasing a mattress topper for someone else, and aren’t quite sure what they’d prefer, or you’re putting in a guest bedroom, this is a great all-around choice. The topper is made from two layers of foam: 1.5” memory foam on the top, and 2.5” high-density foam on the bottom. The maker claims this helps reduce motion in the topper when your sleep partner moves. The foam used is CertiPUR-US Certified, which means it meets requirements for low volatile organic compound emissions and other material specifications. This is the only topper reviewed that comes with a case included. The cover is polyester mesh and can be removed for washing. 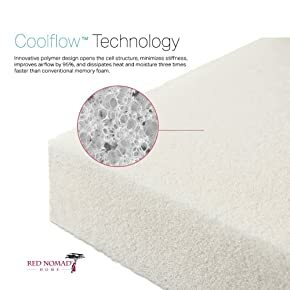 Due to the high-density foam used, this is one of the heavier toppers, and reviewers recommended that it be unpacked and allowed to decompress on top of the mattress you’ll be using it with. Otherwise, it’s a lot for one person to try and move. Many reviewers felt that the support and softness of the topper were just right – not too soft, not too hard. It comes with a 5-year warranty. Double – layer construction reduces motion transfer. Some reviewers mentioned a lingering odor from the memory foam. Memory foam is not as cool as some other toppers. Q: Can I use just a topper as a mattress? A: Although these toppers are thick and comfortable, they are not meant to be used as a mattress. They can, though, change a firm mattress into one that is just right for your sleep style. Q: Will my sheets fit once I put on the topper? A: If you are currently using deep pocket sheets, they should fit well over the new mattress topper. If not, your regular fitted sheets may not extend fully around the edge of the mattress once the topper is in place. Q: If my current mattress has a big dip in it, will a new topper help? A: No. the topper will only add an additional layer of padding to the mattress, not fill in any low spots. Q: Isn’t memory foam supposed to be hot to sleep on? A: If you tend to stay warm while you sleep, memory foam does retain more heat and can be uncomfortable. Consider one of the poly-fill or gel-blend mattress toppers instead. For side sleepers, having a softer bed that cradles you and relieves the pressure on your hips and shoulders is key to your sleeping comfort. If your current mattress is not ready to be replaced, purchasing a mattress topper can give you a sleeping surface that is more conducive to a good night’s rest. Even with some common features, the best mattress topper for you can be different for someone else. The heat retention can be a key factor if you tend to get hot while sleeping. 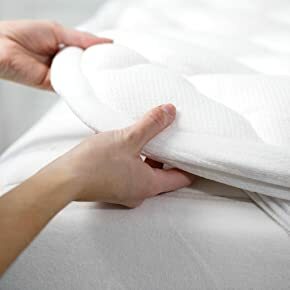 Anyone with environmental allergies will want to consider the materials that go into the mattress topper, and how easily it can be cleaned or laundered. For those concerned about their green lifestyle, there are a variety of manufacturing specifications that can be considered. And, your own size and personal preference can be a factor in choosing the correct thickness of your new mattress topper. Once you’ve determined what’s important to you, our recommendations will help you make an informed and quick decision about your upgrade to your bed!